Not so long ago we visited a Mexican restaurant that prides itself on authentic Mexican cuisine yet our dinner turned out to be tasteless and disastrous. During the 5th Beirut Cooking Festival, we stumbled into the food court around lunch time and we were hungry. We opted for a chicken burrito from El Gringo Mexican Food truck, we were amazed the portion was huge and the ingredients were filled with flavor. Last weekend we were invited along with our fellow foodies to a menu tasting. Having already tried their burrito we knew we were in for a real treat. As we sat chit chatting and snacking on warm cheese nachos we could smell the mouthwatering scents happening a few feet away from us and we couldn’t wait to start eating. 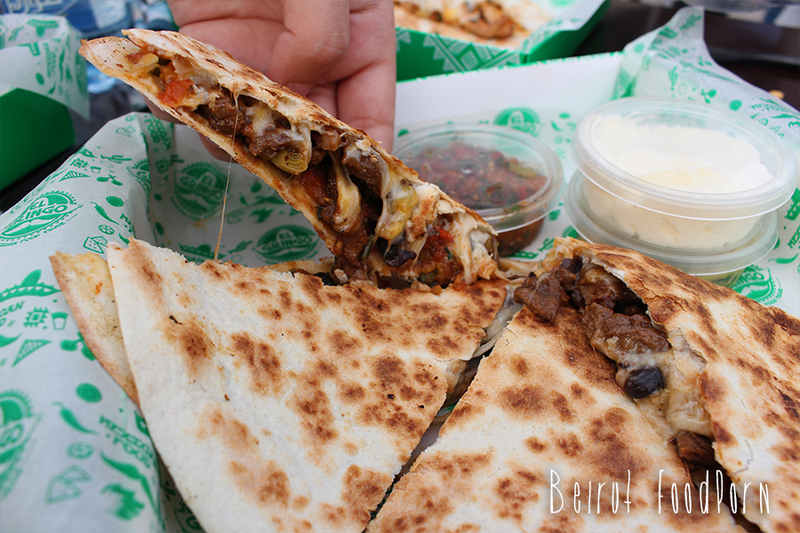 We tried both chicken and beef quesadillas and they were equally delicious! Chicken is usually the safest choice considering beef is always a disappointment right? Wrong! El Gringo guys know what they’re doing, the beef is extremely tender resulting in an enjoyable and recommended quesadilla. Now for the chicken burrito, as mentioned earlier we’ve already tried it but we found ourselves dreaming about it all week and could not wait to have it again! A big portion filled with chicken, beans, rice and many more ingredients that mix perfectly together to make a juicy and tasty burrito and our favorite item on the menu. It’s definitely a must try! Last but not least, we had the Taco De Pollo (chicken taco). It was very good and had a very generous filling. A meal is never complete without dessert and dessert from El Gringo’s is a must. A chocolate quesadilla filled with nutella, mozzarella, banana and nuts. A very well balanced filling making the perfect finish indeed. We advise you to run and we mean run whenever you come across El Gringo’s truck and give their menu a try. They have a fixed daily location at LAU Jbeil but they also move around at night. You can catch them at Trainstation in Mar Mikhael from the 2nd to the 6th of December.